Bologna, “The Red Brick city”, still burns bright in my memory… an often overlooked jewel in the Italian crown. For me, the Bolognese way of life, it’s sights, sounds and inhabitants will forever be a part of me. Spending my ERASMUS year studying in Italy was a brief period of untamed spontaneity that changed my outlook on life. Turning twenty-one in Bologna was a milestone of maturity that provided me with a special sense of independence and self sufficiency. Finding an apartment, taking courses in a foreign language, making new friends from across the globe… it was an ongoing, relentless adventure that I miss to this day! I remember the wine tasting trip in which I met my first group of Dutch friends. I remember the trip to San Marino where we were seemingly walking amidst the clouds. I can remember hitchhiking from Bologna to Nice. These are fragmented images that define the friendships I made during my ERASMUS year. Bologna, “The Red Brick city”, still burns bright in my memory… an often overlooked jewel in the Italian crown. My first impression of the city is probably walking along Via Zamboni in the heart of the student district. 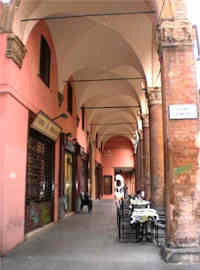 The portici (undercover walkways) lined the streets and operatic melodies spilled into the Piazza. As I looked around I could see first hand the diverse demography of the place I would soon call home. Loitering around the square were the Punk a Bestie (Punks with beasts). These bizarre characters represented a fervent sense of rebellion and angst from within the ranks of the Italian youth. They aimlessly staggered around, a can of peroni in one hand, a leash in the other. In contrast, the fashion conscious Fighetti sauntered from place to place with a self-confident attitude of superiority. The grimly overcast sky could not stop them from wearing their two hundred euro sunglasses that seemed to consume their entire face! In the corner of my eye I noticed a shady looking man casually cutting a chain from a parked bicycle. The scene reminded me of the film “Ladri di Biciclette”, and I half expected an angry mob to start chasing him down the street. Simultaneously, an elderly eccentric spouted politically angered sentiments from a massive megaphone, as a student demonstration cascades its way through the University. I was an Englishman adapting to an alien culture… I knew my adventure had begun! My house was in the district of Via Lame, near the city center and only a few minutes walk from Piazza Maggiore. My housemates all spoke German as their mother tongue, yet claimed to be officially Italians. Hannes lived on the border of Austria and was actually South Tirolese (South Tirolean). As if learning Italian wasn’t already difficult enough, he spoke a uniquely abstract blend of Italian and German I never knew existed. He did however speak fluent English, telling me he managed to gain proficiency by habitually watching the English “Top Gear”; quite amazing really. Via delle Lame linked directly onto Via Ugo Bassi, from which point you can observe the imposing figures of the two towers. Slightly slanting to one side, they were a typical representation of sub-standard Italian handy work, yet nonetheless acted as the cities loyal and watchful guardians. Apparently, if a student is to climb to the top of the tower during the study period, they will be destined to fail their degree. Needless to say I avoided the ascent! 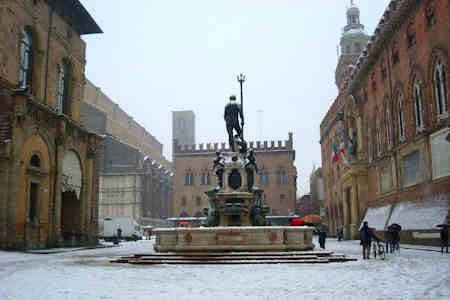 The main piazza is distinguishable by a large church and also the Neptune fountain. All I can say when describing the Neptune fountain is…”Neptune’s Finger”. I won’t elaborate, just go and see it for yourself! Directly past the fountain are the spectacle of “The whispering walls” where messages can be sent from one side of the building to the other. In the summer the square comes to life in an vibrant array of events and attractions. From August onwards an immense open air cinema is constructed, and Piazza Maggiore becomes the venue of various musical concerts and entertainment. The square intertwines itself with the main shopping street of Via Indipendenza. They love their obscure outlets. I could count at least ten shops dedicated specifically to designer baby clothing! For the lovers of authentic designer gear, the elegant and classy Piazza Cavour is home to brands such as Gucci, D&G, Armani… the list is endless. Whether it be shopping, eating or drinking, Bologna is a haven of excess that let’s just say, left a little hole in my wallet. As light turns to dark, the Due Torre rest their watchful eyes, oblivious to the multitude of pleasure seekers that suddenly emerge. Bologna is a lively student town with a striking multicultural community. 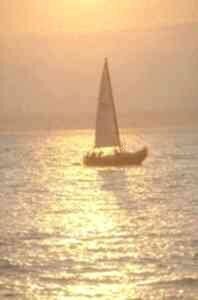 My early evening excursions were special occasions, never to be replicated. The hopes and fears of all the ERASMUS students amalgamated into an electrical storm of emotions. As the vino started to flow, everybody seemed to be in some way connected by a common situation. National history, cultural divisions, religious views, political contrasts… none of these seemed to matter any more. The ideal way to start a night on the town is to sample some of the mouth-watering Italian food. In my personal opinion, Bologna is the Italian capital of cuisine, every corner keeping a delicious secret, just waiting to be discovered. The traditional restaurant are known as Trattoria’s, and provide sensational home cooked dishes and an authentic setting and ambiance to match. I dined many times at a place called Trattoria Il Rosso. This place provided a friendly service and a unique mixture of economy and taste. Be sure to sample the Stinco…don’t be discouraged by the name! It is essentially a huge slab of meat swimming in it’s own succulent juices; you simply cannot go wrong. If it is a true Italian pizza you are after, visit my next door neighbour, Pizzeria Petroni. I found myself frequenting this pizzeria all too often and quickly became a regular. I fell in love with the Saracena! My friends and I normally went for “Aperitivo”. This is a stereotypically Italian concept that involves a wide range of local dishes and savory bites served up in the form of an all you can eat cold buffet. The price normally includes a drink of your choice. These are to be found in various cafés and bars scattered throughout the City. My Aperitivo of choice was a place called Mambo. Mambo was a combination of both a bar and an art gallery. The clientele were often smartly dressed and an intellectual vibe could be felt from within. It’s good to pretend to be intelligent once in a while! Overloaded with food and slightly tipsy on red wine, we would take a walk to Piazza Santo Stefano. The sight of a visually stunning church, this cobbled square was a vivacious student hub. The sounds of the guitars could be heard through the moonlight, as the area soon became engulfed by noise and laughter. It was a great place to sit and relax whilst taking in the sheer beauty of the city in which we now resided. The nightlife in the city center involves a healthy mix of various styles and tastes. You could go to Transylvania, a Gothic cafe that is often the venue of live bands playing a combination of Rock and Metal music. Cafe Rubik is a small bar with a highly charismatic bar tender. Magic Sam is originally from Cameroon, and also the inventor of the infamous “Magic Sam Cocktail”. Piu Forte! Dance clubs include the underground Arteria, Soda Pops and Kinki. Near Porta Lame is Cassero, a gay club that is set in an old factory like setting, reminiscent of a rave. If in Bologna for a length period, purchase the ARCI card, providing free entry to various establishments at a one off fee. Enchanting by day, Energetic by night. My time in Bologna was almost like a fairy tale, in the sense I often needed to pinch myself to see if it was actually real. I arrived in September as a twenty year old boy whose Italian language skills were average at best. I departed in June as a twenty one year old man, fluent in two different languages. The ERASMUS program really does bring Europe closer together. 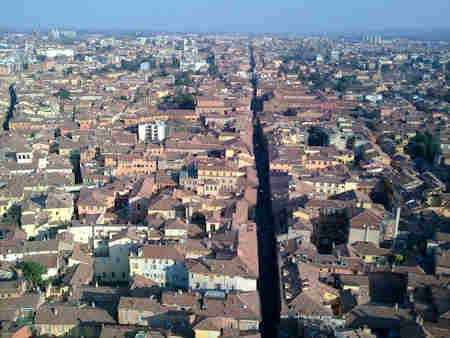 Living in Bologna, it felt like the whole world was right at my doorstep. All I needed to do was reach out and touch it. This captures the region in a few pictures. A brief guide to Bologna. If you enjoyed reading the above article then you will probably also enjoy Paris by Stewart Collins, and Bath, Cotswolds and Edinburgh, also in Europe, and our latest articles covering the Orinoco Delta, La Mata, Marbella and Beijing.